The saint lists some fifteen “marks” of the Church’s supernatural character. One of these is the “unhappy end” of those who fight against her. History is littered with the detritus of figures great and small who took arms, physical and moral, against the Church. Some of the most notorious are embalmed and, ironically, on display in the lands they ruined, while the tomb of Christ is empty. Bellarmine did not gloat over this. His was not the happiness which Ambrose Bierce defined in his Devil’s Dictionary of 1911 as “an agreeable sensation arising from contemplating the misery of another.” The saint spent his life trying to save the Church’s enemies from an unhappy end. 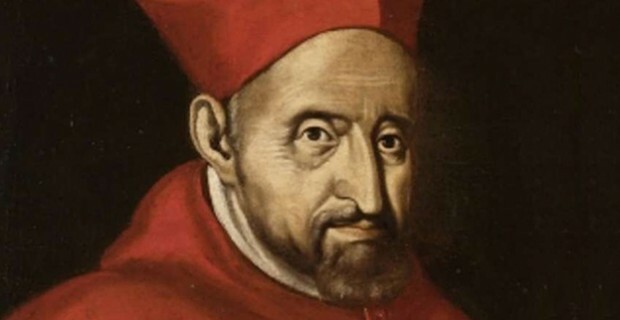 He wanted others to share in that other mark of the Church: the “temporal peace and earthly happiness of those who live by the Church’s teaching and defend her interests.” In his method of explaining the Church, Bellarmine sounds like Blessed Teresa of Calcutta who said, “People are often unreasonable and self-centered. Forgive them anyway. If you find happiness, people may be jealous. Be happy anyway.”In the “pursuit of happiness” — which even our Declaration of Independence names as a natural right — the Church is not a casual option. Christ is the source and goal of true happiness. Pope Francis recently said, “No one comes to Christ without the Church.” Christ is the Bridegroom, and the Church is his Bride. To want Christ without the Church is like the corrupting conceit of cohabitation before marriage. Just as bulimia is an eating disorder, so conjugal life outside matrimony is a love disorder. The joy promised by our Lord is through, and not despite, full union with the Church which is his body.